A Canadian telecommunications company is implementing plans to lay a fiber optic cable from London to Tokyo by way of the U.S. and Canadian arctic, and is readying summer marine surveys to map exactly where it will lay the cable. When complete, several spurs off the main fiber line could mean high-speed broadband internet for many communities in northwest Alaska. Arctic Fibre is the company building the fiber backbone. Anchorage-based Quintillion Networks is the “middle mile” provider in Alaska who will link the fiber optic pipeline to local telecommunications providers in Nome, Kotzebue, and other communities in the Bering Strait and along the North Slope. Despite international complexity and an approximate $650 million price tag, Quintillion CEO Elizabeth Pierce said during a visit to Nome this week that the project is far enough along for marine surveys to start this summer, “which is actually ships in the water using sonar and video to map the whole route of the cable,” she said. 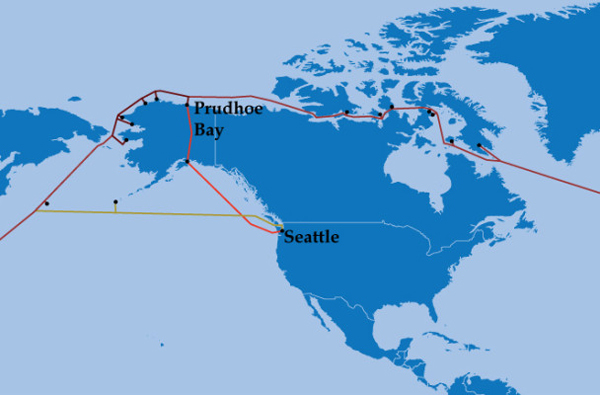 “The cable will be built this winter to exactly match that route,” she added, with a timeline of laying the fiber in the arctic by summer 2015. Pierce’s presentation highlighted the sonar equipment Quintillion and Arctic Fibre intend to use in its surveying this summer. The company’s presentation showed the equipment to be similar to what some oil companies use in their undersea mapping process. While the risks mentioned in Quintillion’s presentation in Nome discussed issues that could negatively impact the fiber project, the company did not note what, if any, impact the sonar surveys and eventual subsea construction work could have on arctic ecosystems. The report also made no mention of potential impact on subsistence species.